Masala powder (also known as curry powder), is an exotic spice mixture consisting of among others: coriander, cumin, fenugreek, and turmeric. Sometimes additional ingredients such as ginger, garlic, cinnamon clove, mustard seed, green cardamom, black cardamom, nutmeg, red pepper and black pepper are added. It is commonly used in the East - Indian cuisine but also in that of the West Indies and Surinam. Although basically the same, masala powder from Surinam is an aromatic blend that is more flavored, spicier and tastier! Use it in fish, chicken and vegetable dishes. The Masala must be cooked before consumption. 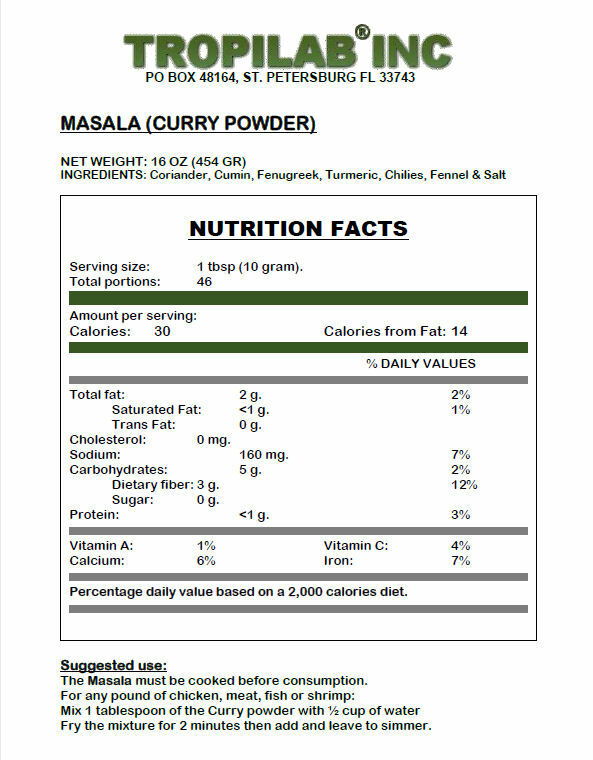 1 tablespoon of the Curry powder with ½ cup of water. Fry the mixture for 2 minutes then add and leave to simmer.